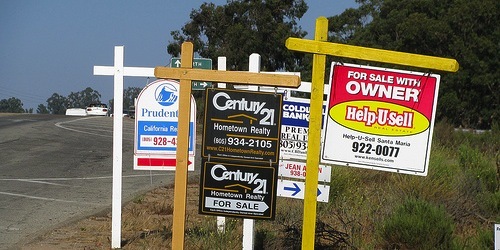 Redfin vs. Zillow vs. Trulia: Which Is Better? There have been plenty of exciting match-ups throughout history. Rabbit vs. turtle, cobra vs. mongoose, Magic vs. Bird…the list goes on. But how do you choose when three very similar real estate listing websites with equally ridiculous names are all wooing you for your business? Well, you break it down to see what each does better and go from there. One thing I like about Zillow is their “Zestimates,” which are essentially free house values provided using an automated valuation model (AVM). This is how Zillow went from silly name to household name, seemingly overnight. They even have Rent Zestimates now, which could be useful for investors or even those deciding between renting vs. owning. By the way, Zillow’s name came about because their goal was to provide “zillions” of data points…and it’s a play on pillow. Of course, the value of these estimates is highly debatable, but it’s still another piece of data to look at in your real estate search. Zillow also provides lots of real estate listings, complete with photos, sales history, tax information, and even a housing payment estimate, which I also like. Their housing payment calculator is great because it actually includes taxes, homeowners insurance, and mortgage insurance, if applicable. So it doesn’t just show you an ultra-low monthly mortgage payment. And now the bad. Zillow seems to constantly display outdated listings, whether they’ve already sold, are now pending, or taken off the market entirely. So in terms of timeliness, Zillow misses the mark. That said, Redfin always seems to provide the timeliest information. Take the same set of 4-5 listings just mentioned, and there’s a good chance Redfin will tell you what’s really going on. Redfin works with several local multiple listing services to ensure data is updated and accurate, with many MLS listings refreshed every 30 minutes. They also have real foreclosure listings, unlike the other guys. So if you’re shopping for new listing ideas via the Internet, Redfin may be the best choice if you don’t want to waste you (and your real estate agent’s) time. You can even setup automatic alerts to get the newest listings with your criteria the minute they come online. Redfin also provides Zillow’s Zestimates at the bottom of each listing now, along with another third-party appraisal from eappraisal.com. Not only that, but they also provide solid square footage data, which makes it easier to dig into the values of the properties you’re considering. And their latest feature is “notes” left by agents who have visited the property to provide more insight to those casually browsing online. Finally, and this is a huge plus if you’re shopping for condos, Redfin lists the HOA dues on each listing page. For some reason, Zillow doesn’t, which makes it pretty difficult to shop for a condo, given the fact that HOA dues can be several hundred dollars a month, and certainly sway one’s decision to buy. Note: Redfin is an actual real estate brokerage, unlike the others which simply provide information. 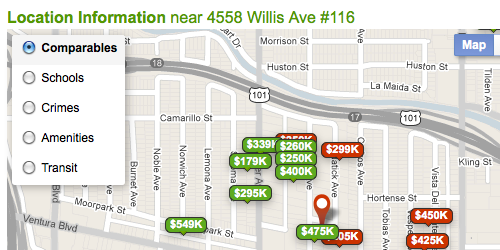 Lastly, we have Trulia, which has all the same listings you’ll find with Zillow and Redfin. They also provide robust data, such as detailed square footage data, selling prices for a given area, and real estate trends, which provide good insight into house values. They also offer a “Trulia Estimate,” which is quite similar to a Zillow Estimate. But what sets them apart is their local map view data. You can see comparable sales, nearby schools, crimes, amenities, and transit, all on a map next to the property you’re considering. This can help you get a better idea of a property’s surroundings, which goes beyond standard real estate listings. So there you have it. In the end, it sounds like Zillow, Redfin, and Trulia all have their advantages and disadvantages. And all of them can be used side-by-side when searching for real estate on the web. However, because they all receive data in different ways at different times, you may find lots of discrepancies, which can certainly be frustrating. That’s why it’s best to take the information you find on these sites with a grain of salt and always consult with your agent to ensure you get the most accurate data. Read more: How much should I put down on a house? POSTED IN » Real Estate Vs. I like Redfin best for home data while shopping for a home because it is the most up-to-date and Zillow for the Zestimate. How Much Should I Put Down on a House? Is Now a Good Time to Buy a House? Prepaid Interest | When to Close Escrow?